True, September has by far been the nastiest month for the Dow Jones Industrial Average over the last century, with an average loss of 0.8%. That compares with an average gain of 0.8% in the other 11 months. 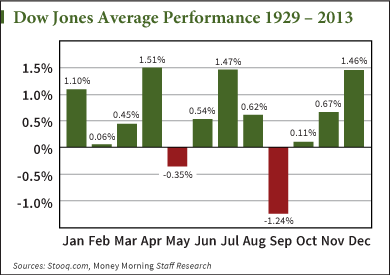 Since 1929, the Dow average performance for September has been a 1.24% loss (see the following chart). The S&P 500 Index, meanwhile, has ended the month with an average loss of 0.5% since 1950. September's ominous reputation tends to drive some short-term traders to pare down their stock portfolios as the month approaches, or at least to remain guardedly on the sidelines sitting on cash they have accumulated. Concerns for a September swoon have intensified this year because more than three years have passed without a market correction (a decline of at least 10%). The historical average is for one correction occurring about every 12 months.